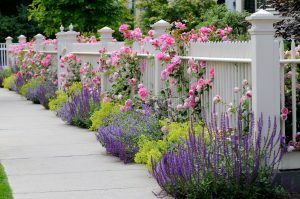 Learn how to pick the perfect fence for your yard. A great way to update and spruce up the look of the exterior of your home is with residential fencing. Whether you currently have a fence or plan to install a new one, fencing makes a large impact on the overall look and experience of your home. Here are some ways you can pick the perfect fence for your yard. The first step is selecting the perfect fence for your yard is to give it a purpose. Why are you installing a new fence? Do you want more privacy or safety for pets and small children? Is it purely for aesthetic purposes? Do you want to make your home more secure? The answer could be a combination of the previous questions. Once you’ve chosen the purpose for the fence, it will help narrow down a lot of your choices when it comes to materials, height, and other accessories. Every style of fence comes with some level of maintenance; some higher than others. When selecting the perfect residential fence for your home, you should consider the level of maintenance that you’ll be available to take on. Wood fencing requires the most maintenance because it needs to be stained every couple of years and protected from rotting and insect infestations. Aluminum and vinyl fences require the least amount of maintenance with just periodic cleaning. However, when it comes to damage, it’s easier to replace individual wood board whereas you may have to replace your entire aluminum fence if it gets damaged. Do you live in a neighborhood that has a home owner’s association? If so, they probably have rules about what kind of fence you can install. In general, the municipality in which you live may also have regulations in place about fence height and materials. Make sure that your fence is in accordance with those rules in order to avoid fees or having to remove the fence altogether and starting over. This entry was posted on Friday, September 28th, 2018 at 2:40 pm. Both comments and pings are currently closed.